I have been a visual artist for most of my life. Printmaking, painting, artist books, sound and drawing are tools I have used to try and express the growing, natural world, in one form or another. Gardening connects me with fundamentals - through air we breathe and food we eat, we are made one with the whole scene around us. I try to reflect this in what I make. My work is in private and public collections, including the Victoria and Albert Museum, Dartington Hall Trust, Oxford University and hospitals in the South West. I have exhibited in commercial and public galleries across the UK since 1990 and something of mine can always be found at the Devon Guild of Craftsmen's Riverside Mill Gallery in Bovey Tracey. I welcome visitors to my home studio. Invitations to commission can be made directly through this website, by ringing 01803 732634 or by email - sue@suedeakin.com. This artist has been practicing since she first graduated in 1976. 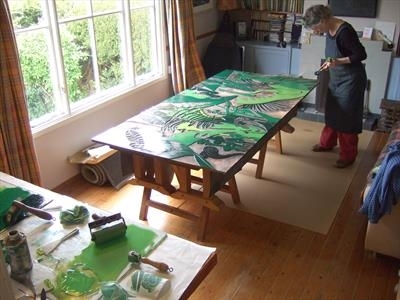 Preferring the natural world to the man-made one, Susan tries to draw attention to its complexity and beauty through printmaking, drawing and painting, sound and book works. Although she exhibited widely for many years, this aspect of 'artistry' has become less absorbing in recent years. 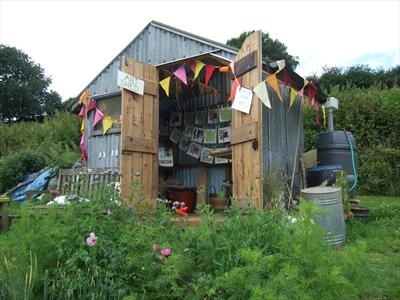 Instead, the cultivation of her own food has become a powerful stimulus and she regards her garden and allotment as both larder and studio. Patronised in the past by health authorities and private individuals, Susan is open to new ideas for commissioning. 2012 Leafery "The National Gallery of Lyme Regis"